Alumina (Al2O3) has a wide application due to its versatility and low material cost. Alumina possesses a high melting point, strong hardness, and good chemical stability, making it a good material to withstand high temperature and chemical corrosion. 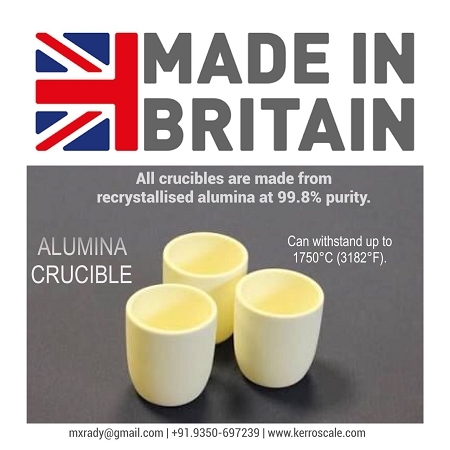 Alumina Crucibles are available in many sizes and shapes. Also Available Alumina Boat & Other Alumina Labware. High purity alumina products can withstand very high temperature under reducing, inert or high vacuum condition. They remain good chemical resistance under high temperatures, and have excellent wear and abrasion resistance. What's the highest temperature that 99.9% alumina products can withstand? Alumina products can withstand up to 1750°C (3182°F). What should I pay attention to when I use alumina products? 1. Alumina products are fragile. Please handle them carefully and avoid collision during unpacking, transportation, handling and cleaning. 2. Check whether any micro-cracks exist before using alumina products. Products withmicro-cracks should not be used. oven, make sure that the dry process goes slowly. 4. Do not load too many materials in alumina crucibles, which can increase the possibility ofuneven heating. the crucibles can be evenly heated to reduce the impact of thermal shock. It usually takes about 3 hours to increase to high temperature. a hot crucible. If taking the crucibles out of furnace into room temperature to pour the melted material, try to control the process as short as possible. 7. Avoid contact of heated alumina products with a cold surface. Use insulation materials assupport of alumina crucibles. ASSURANCE OF BEST QUALITY WITH LOWEST PRICE. JUST ASK!